Hi there! Today I’m sharing a review for a YA fantasy/adventure/romance that I just adore from Susan Kaye Quinn. THIRD DAUGHTER is the first book in a series that follows the path of a young princess who’s determined to save her country from war, and marry the love of her heart. It’s a sweet series and, with THIRD DAUGHTER currently FREE in ebook form on Amazon, it’s a great way to get started. I’ve read and LOVED both SECOND DAUGHTER and FIRST DAUGHTER, which continue this adventure and love story to completion. Sneaking out of the palace wasn’t one of Aniri’s best ideas. But she’s the Third Daughter of the Queen of Dharia—zero responsibilities and zero royal duties. She’s just the backup daughter, in case her older sisters’ arranged marriages—to take the crown or broker an alliance—don’t quite work out. But once Aniri reaches her 18th birthday, she’ll be truly free, and then she can marry the charming fencing instructor she meets for fevered kisses in the forest. “I love you, Aniri,” Devesh whispered. Aniri drew in a shaky breath. Prince Malik said he would allow her a lover, even though arranged marriages were expected to be true marriages, especially among royalty. But could she live that kind of life? A secret love on the side while performing the duties of Queen in a foreign land? The idea made her shudder. It pained her every day her love for Devesh was kept hidden. She couldn’t imagine a lifetime of it. Nor could she picture Devesh, with his love of the court and all things political, banished to the frozen wastelands of the north simply to be her consort. He stepped back, and with clasped hands and a short bow, he turned and strode away. Her heart tried to beat its way out of her chest to follow him. If she accepted Prince Malik’s offer, she would lose the man she loved. Unlike the Jungali prince, she wasn’t sure that was a price she was willing to pay. If you had to marry for love or marry for peace, what would you choose? That’s the question facing Princess Aniri, Third Daughter to the Queen of Dharia. It’s two weeks until Aniri turns eighteen and can choose to marry her beau–Devesh, a courtesan and emissary from Samir, a neighboring nation and trade partner. Her two older sisters have already married men that complement their station, even when love is not present, and Aniri is determined to follow her heart, not her duty. Especially when her duty involves marrying Prince Malik, heir to the throne of the barbarous northern Jungali provinces. No. No! NO! Except, Aniri knows she can’t decline outright–and rumors of a Jungali airship weapon are serious indeed. If Aniri accepts the prince’s proposal she can get close enough to find out if the airship is real–and maybe she can help her homeland and her mother’s Queendom figure out how to avoid a war. Prince Malik makes it easy on Aniri–he tells her their marriage would be one of business. That she could (discreetly) take a lover if she wished. Hmm… And her mother, the Queen, assures her that the choice is hers. Aniri does what she must–becomes a spy. I loved her reactions to the “barbarians” she encounters on her journey north! Oh, how sweet to have her realize, “Hey, they’re pretty awesome in their own way!” Then Devesh shows up and tells her the airship is a ruse–a trick to get her to marry Malik. After which she will be killed and her beloved country Dharia overrun by Samir and Jungali. Aniri doesn’t know whom to believe, and espionage is not her strong suit. The political intrigue is high and Aniri barely escapes an attempt on her life. The tension is fierce throughout. Each new chapter brings Aniri closer to either love, or death. We get a fantastic steampunk world, with an East Indian flair, and a strong female main character who picks up the ball and runs her hardest. Even when she fumbles, Aniri is worthy of cheers because she learns from her mistakes and never quits. What I hadn’t expected, and thoroughly adored, was Malik’s assistance. He realizes his only shot at peace is this marriage, and he’s willing to trust a confessed spy with the biggest military secret of his country. Aniri could never have learned what was necessary to save her people without Malik earning her forever trust. And Devesh? Well, perhaps an on-the-side lover isn’t the best place for him in the Jungali court. In the end, Aniri does choose her own husband. And she chooses very well indeed. Three words to describe this Third Daughter? Indomitable. Passionate. Resourceful. She’s my kind of heroine. And, can I say the cover is exquisite? The internal art (chapter headings and section breaks) is just as lovely, and speaks volumes about the care that went into making this book. I absolutely LOVED it, and would recommend it to any YA reader. Its smidgen of passion–some swoony kisses–won’t make you blush, but will get your heart beating. Interested? 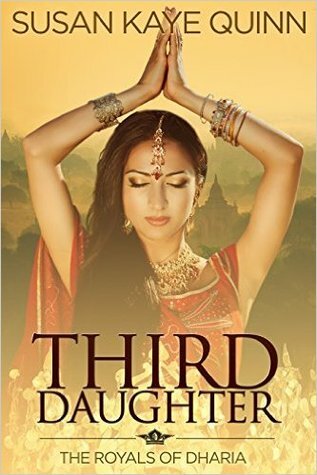 You can find THIRD DAUGHTER at Goodreads, it’s currently FREE on Amazon, and on paperback through Barnes & Noble.